All digital cameras have a standard setting for automatic exposure. It is with the help of the metering system within the digital camera that the amount of light is measured and the best-fit exposure value is determined. 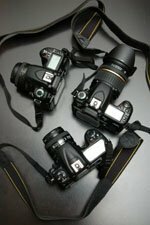 Since usually not all parts of a scene are equally important when determining the best exposure, most digital cameras offer more than one metering modes. The metering mode refers to the way in which the digital camera determines the exposure. Evaluative, sometimes called matrix, metering is probably the most complex metering mode but offers the best exposure in most circumstances. Essentially, it divides the image area into a matrix of metering zones and compares the measurements made of each individual area against a library of typical scenes to select the best possible exposure for the scene. The system then selects the best possible exposure for the entire scene. The overall exposure is based on an algorithm specific to that camera make, and typically manufacturers are not very forthcoming with the algorithm details but factors such as Auto Focus (AF) point , distance to subject, areas in focus or out of focus, colours/hues of the scene , and backlighting are taken into consideration. The evaluative mode tends to be biased towards the selected autofocus point while taking into account other areas in the frame, thus ensuring that the point of interest is correctly exposed. A Center-weighted averaging meters gives higher importance, between 60 to 80 percent of the sensitivity, towards the center of the image. The balance is used to average the exposure towards the edges of the image. Some cameras will allow the user to adjust the weight/balance of the central portion to the peripheral one. This metering system is one of the most common metering methods implemented in digital cameras and the default for those digital cameras which do not offer metering choice selection. Since this method is less influenced by small areas that vary greatly in brightness at the edges of the viewfinder, it is a good mode to use when shooting a large main subject against a very bright or very dark background such as portraits. Spot metering allows you to meter a very small area of the scene between 1-5% of the viewfinder area to decide the correct exposure level and the exposure of the rest of the frame is ignored. The spot area can be selected either in the center or on some cameras as a small area around the selected Auto Focus point . The spot metering is very accurate and is not influenced by other areas in the frame which make it ideal to shoot very high contrast scenes such as brightly backlit, macro, and moon shots. A variation of this method is the partial metering mode found mostly on Canon cameras and is characterized by selecting a larger area than spot metering, around 10-15% of the entire frame. It is best utilized when there are very bright or very dark areas on the edges of the frame so that you can avoid then influencing the exposure metering.